I’ve mentioned to a few people at the MakeSpace that my professional programming environment for hardware and instrument control is National Instruments LabView. Nobody else that I have talked to at the space had even heard of it - probably because of it’s high price and the fact that your average maker/arduino hacker wants everything for free. This has always struck me a slightly odd, since people realize that you have to pay something for hardware, why not be willing to exchange value for value and be willing to pay something for good software development tools also? NI is now pushing to make inroads into the Maker culture by offering the Labview home bundle for just $49. This is an incredible deal since the LabView that I use daily has a seat license price of around $5000. Labview is an incredibly powerful programming environment that provides functions WAY beyond anything that any Arduino programmer ever dreamed of. Although the commercial version of Labview also runs on Linux and Macs, the home/maker bundle runs on window only. If anyone is interested, I’d be very happy to provide more details and maybe even give a demonstration. Maybe I need to provide a little more info to wet the appetite of the “Makers” around here. There are some “Makers” hanging around here, aren’t there? The home “maker” version of Labview is designed to work with free open-source labview functions (VI’s) and drivers for various embedded platforms such as Arduino, Raspberry Pi, Sparkfun boards, a wide range of Chipkit boards sold by Diligent, and others. A simple Arduino Leonardo board (under $10) is a good way to start. The boards serve as a I/O portal, with firmware flashed on them by one of the open-source API’s such as LINX. The connection is normally by USB, but it could also be an RF link such as bluetooth, WiFi, XBee, or potentially even a longer range RF serial link such as the 3DR telemetry radios that we multicopter pilots use for two way communication and telemetry that is good for up to a mile. For those of you without C programming skills, LabView itself is much easier to learn than the C-like language in Arduino. It is graphical in nature, but it embodies all of the advanced structures and functions of most modern programming languages. It is very modular and very high level - making complicated tasks easy to accomplish. The built in functions (Vi’s) are geared towards a wide range of engineering applications. Signal processing and analysis - including many FFT related functions, advanced mathematics, PID and Fuzzy logic process control, many networking and communication protocols, easy interfacing with external applications, automatic report generation that exports data to Microsoft Office applications. It has easy to use, yet sophisticated, array and matrix data manipulation functions. 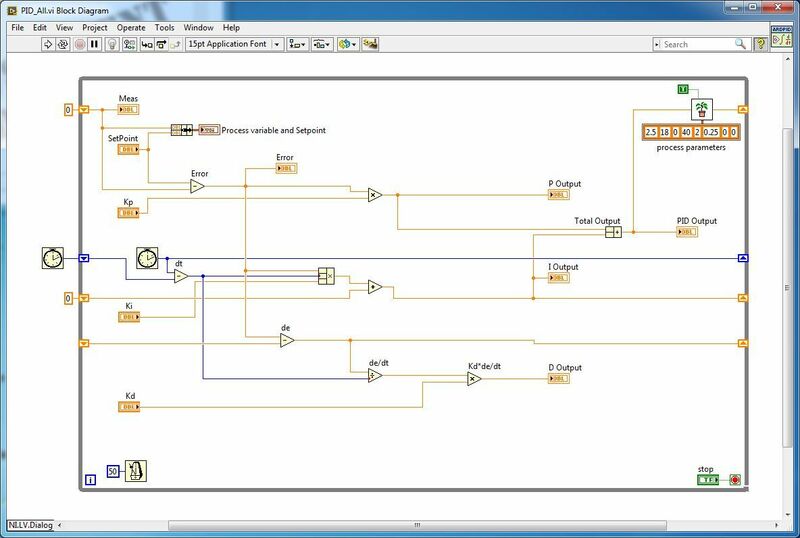 Labview is multi-threading, meaning that it can have many concurrent tasks running at once inside (and outside) any running application. Data can be passed and synchronized between them using queues, notifiers, semaphores, and such. There are many specialized datatypes such as waveforms and clusters which allow multiple datatypes to be bundled together and passed via a single “wire”. There appears to be a very nice selection of I/O functions and commands included in LINX and other interfaces to embedded hardware like Arduino boards. If you are able to do a little Arduino programming, you can even create and add your own custom commands to LINX, etc. To summarize, the thing that is so awesome about all if this is that we have at our disposal some VERY powerful building blocks that allows rapid creation of projects far beyond what could normally be accomplished in a short time with Arduino and the Aurduino function libraries. By leveraging more powerful building blocks we can build much more sophisticated applications without having to re-invent wheels along the way. The only shortcoming, (or advantage - depending on your viewpoint) is that there is little or no custom Arduino code to write and run on the Arduino board itself. The Labview code runs on the host PC, with all data being passed between it and the Arduino board. Although this link is typically wired, it can be wireless as mentioned above. I would be interested in some LabVIEW demos. We can probably use some of the laptops lying around, if we get them working. I can install it on my laptop and bring it in for a demo. The home version allows you to install it on three machines. I ordered a couple of cheap Arduino boards (A Leonardo, and a Mega2560) from Banggood just for use with Labview. Well,I’ll probably be around Wednesday if you can make it in.if not we can attempt to schedule something. I won’t have the boards for probably two weeks or so. The only Arduino board I have right now is a Due board, and LINX doesn’t support it yet. It would be more interesting with some hardware to actually control. I’ll re-awaken the thread once I get the boards and we’ll plan a demo some Wednesday evening. I just discovered that there is a Arduino compatible compiler for LabView, and it supports the 32bit Due board. At $99, I’ll have to think about it. I’m curious about execution speed and memory usage. Compiled LabView code running directly on an Ardunio board. Cool. I have been a fan of Lab View for years. Have had plans for research using it but could not come up with the bucks for the system. I now only run Linux but could be persuaded to fire up a Windows system to aquire a cheap Lab View software. The $49 price for the Home/Maker version of Labview is a steal. I’ve been programming with LabView at work sporadically for 15 years, and much more frequently in the past 6 years. The full version of LabView does run on Linux, but the $49 Home version does not - at least not yet. Most of the programming I do involves communicating with external hardware and doing a lot of math and signal processing. The whole data-flow programming paradigm takes a brief time to get used to, but once you do, you’ll love it. The other feature of LabView that causes some beginners a little trouble is that it is inherently multi-threading, Parallel execution is automatic, and it requires you to learn how to manage passing data back and forth between threads. This makes it very powerful though, and it takes full advantage of the power of multi-core processor machines. Hi Greg , I’m interesting in Labview home for a while but as the dollar is reaching 4,00 BRL is getting hard to buy a copy from here (Brazil). I never worked with Labview due to be very high priced but as a maker I would give it a try. Did you use the home version already ? What do you think about it ? My plan is to use it as arduino ,PIC and Ras Pi development environment. The Home version is identical to the full version which sells for $3000 USD. The only difference is the watermark on the front panel and the agreement not to use it for commercial purposes. 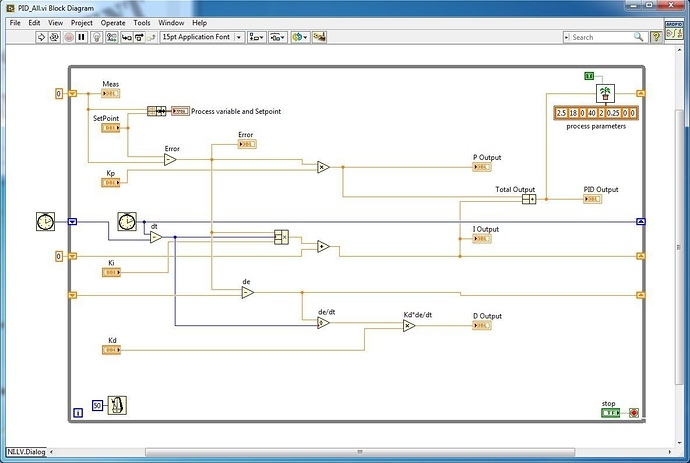 Keep in mind that the Labview code always runs on a PC, with the embedded controller being connected via some kind of link in order to access the onboard I/O ports and connected sensors. The exception to this is the Labview Arduino compatabile compiler . It produces standalone executable code very comparable to the standard Arduino compiler. The difference is that is uses the LabView IDE, which is faster and easier to use - especially for experienced LabView users. This thread sort of revived my interest in the LabView Arduino Compiler, so I decided to buy the Home edition. One of the projects I envisioned for it is was to write a motor controller to run our sonar test positioners at work. I knew I was going to need a PID controller, and since I couldn’t use the native LabView PID vi’s with the Arduino compiler, I was going to have to write one from scratch. One of the things I hadn’t quite appreciated was just how powerful the LabView programming environment was going to be for debugging the Arduino code. I sat down and wrote the thing within an hour or so. 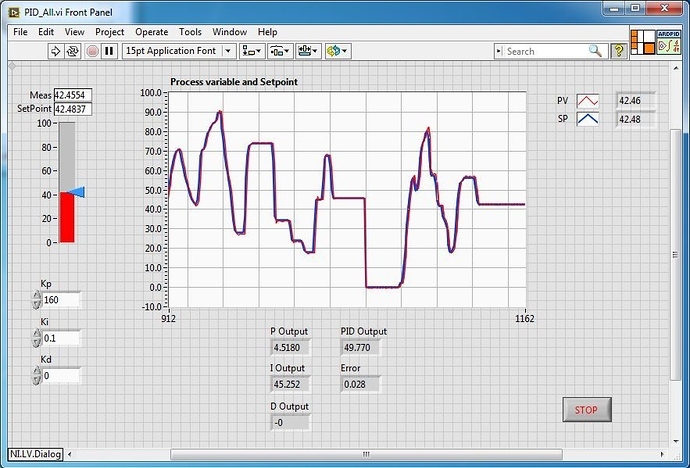 I was able to use Labview debugging tools and probes to verify that the code was running properly. Labview just so happens to have a “Plant System” simulation vi that allows you to mimic the dynamic responses of a hypothetical load process. That was incredibly useful. Those with a sharp eye may notice that the D term was left unconnected. I ended up removing it because I decided that in my intended application, it was going to be of little value. And here is the front panel that runs on the PC. This is obviously for simulation purposes only since the Arduino is a headless system.